Sheep suffering heat stress on an export vessel. FINES totalling millions of dollars and jail terms of up to 10 years for live export company directors responsible for animal welfare breaches are likely under legislative changes being considered by the Turnbull Coalition Government. Sheep Central understands the fines and jail terms are being considered for company directors who are aware of breaches and failed to act, and would bring penalties in the sector in line with other industries. However, Sheep Central has been led to understand the increased fines and jail terms would not be retrospective and it is not known whether penalties are being considered for recent live sheep losses or alleged animal welfare breaches. WAFarmers said the Federal Government’s plans to impose fines and jail terms to company directors who fail to act to prevent live export animal cruelty was an opportunity to further safeguard the future of the trade. It is believed Minister for Agriculture and Water Resources David Littleproud will announce details of the penalties in the coming weeks, WAFarmers said. 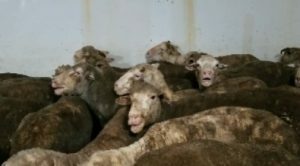 The release of preliminary fine and jail term details today came as political pressure on the Federal Government over live exports increased, after the Australian Labor Party moved to turn community ire over trade standards and sheep deaths on recent shipments into a potential federal election issue. The federal Opposition this week said it would phase-out the live sheep trade inside 10 years if elected at the next Federal poll, although agriculture spokesman Joel Fitzgibbon has avoided any discussion of likely compensation for affected farmers or exporters. “Well, let’s talk about support when it’s necessary, if it’s necessary. “We want to develop a plan which in fact increases farm gate returns for sheep meat producers and I think that’s evidently possible if you have leadership from government, strategic guidance from government and a government prepared to put the work in and take a whole of Government approach,” he said. Mr York said Labor’s foreshadowing the closure of the live sheep trade if they gained government was very disappointing. He had hoped Labor had learned it’s lesson from the temporary closure of beef cattle exports to Indonesia in 2011, that caused serious financial stress to producers and who sought to sue the Federal Government for $600 million in compensation. “A cessation overnight would have radical consequences to many farmers here in Western Australia and would push back some quite significant issues in terms of managing livestock on their farms and trying to find other markets to manage that livestock turn-off. “It undoubtedly would initiate a loss of income for many many farmers. “On transition, if it has to happen and they (Labor) are in government and they make that decision, let’s talk about the consequences and how it would be best to manage that,” he said. Mr York and fellow producer Rob Egerton-Warburton said it would cost the WA sheep industry about $65 million a year if the live sheep trade was halted. Mr York said Animals Australia and RSPCA Australia’s offer of $1 million for a structural adjustment package was “tokenism”. The farmers did not believe any government would be likely to offer an adequate structural adjustment package that could compensate for the livestock price and business losses arising from the trade’s cessation. “If they are fully committing to this they have to start thinking about how the trade can be helped in terms of transitioning, and that will involve considerable investment, either direct in farmers’ businesses, in processing or in looking for new markets. “But I can tell you that whatever transition (plan) or package might be put forward, there will be considerable financial cost and management stress at the farm gate for a period of time,” he said. “You can’t just turn the tap off and expect that volume of stock is going to be absorbed overnight without considerable cost and stress; it needs to be managed. Mr York said the industry is already concerned about the dramatic decline in the WA sheep flock in the last 10 years. Mr York said the likely impact of a trade closure on already-stressed regional communities is “under-recognised” with the involvement of about 4000 people in the trade. Although WA sheep markets were in a seasonally volatile period, Mr York agreed with Mr Warburton assessment that a lack of confidence in exporters buying sheep had already seen prices for some stock drop by $25 a head. A Mercado analysis indicated the potential price impact of a ban on live sheep exports to WA producers based off the slaughter to export price model suggests that an additional 1.6 million head being processed in WA could see prices decline between 18-35 percent, based on a best and worst-case scenario. Mecardo estimated that the price impact on WA producers for lamb would be $23-$43 a head and for mutton sheep of $18 to $35. Mr Egerton-Warburton said there was a lack of buying confidence for live export category sheep in WA at the moment. Mr Egerton-Warburton said there was great opportunity for local processing in WA and the processing sector had the capacity. He said he is a firm believer in the trade continuing, but was realistic and didn’t think it would last forever. “But the industry would need time to transition out of this, a long time. He said live sheep export was a state issue, not a federal issue. The loss of the trade would be “devastating” to the WA sheep flock, he said. SPA chair Chris Mirams said the body is deeply disturbed at the Federal Opposition’s call to ban the trade. “The livestock industry is still feeling the economic and social impacts of the devastating decision made in 2011 to halt live exports. “The pain and distrust is still fresh in the minds of farming communities and our international trading partners,” he said. “The trade is a major component of many producers’ businesses, regional communities and workers who rely on the industry for their livelihood,” he said. “We have an industry filled with professional and innovative producers building their farms and contributing to vibrant rural and regional communities. “Decision-makers must think in terms of how banning the trade will impact them, Mr Mirams said. SPA said it will await the recommendations of the McCarthy Review into exports of live sheep before making any decisions on the way forward. “SPA has committed to waiting until the review takes place and then discussing any recommendations made with its members and other stakeholders to determine the best path forward,” Mr Mirams said.